Absorbed: Plattsmouth news-herald, 1912; Nehawka enterprise, 1952; Elmwood leader-echo, 1953; Weeping Water Republican, 1986; and Louisville messenger, 1986. Description based on: Vol. 21, no. 28 (July 12, 1901); title from masthead. Other editions. : Plattsmouth daily journal (Plattsmouth, Neb. 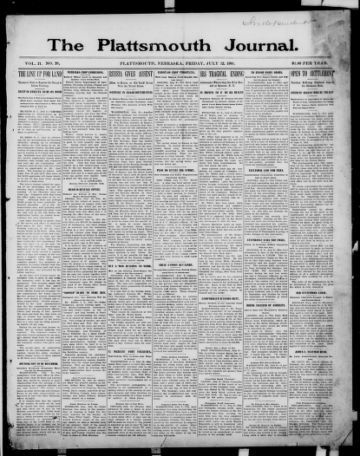 : 1902), 1902; Evening journal (Plattsmouth, Neb. ), 1902-<1913>; Plattsmouth evening journal, <1916-1942>; and Plattsmouth daily journal (Plattsmouth, Neb. : 1949), 1949.